Lewis Hamilton has enjoyed another triumphant season in Formula One. With the 2018 Formula 1 season having come to a close in Abu Dhabi, Three drivers came out on top- Lewis Hamilton and (Mercedes), Sebastian Vettel (Ferrari) and Kimi Raikkonen(Ferrari). A simply brilliant and remarkably consistent season by the British driver, arguably his best ever season in Formula 1. Whether you’re a fan or not, you've got to admit that he was the best driver this season and made practically no mistakes whatsoever. He actually had a rather poor start to the season, and arguably, team-mate Valtteri Bottas was performing better than him. In fairness to Hamilton, in the season opener in Australia, he drove very well and would have won the race had it not been for an ill-timed Virtual Safety Car which enabled Sebastian Vettel to take advantage by pitting and maintaining track position in first place. He also had a poor weekend in China where he finished fourth. 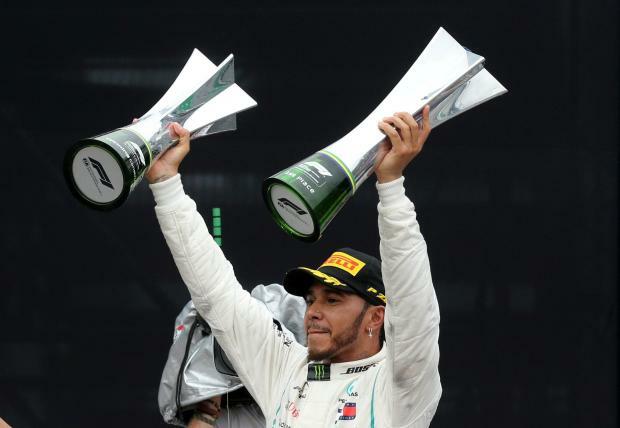 It took Hamilton until the fourth race of the season to register his first win of the campaign, one which came in rather fortunate circumstances, after he profited from team-mate Bottas' rotten luck when the Finn suffered a puncture whilst leading, two laps from the end of the race. Despite this poor start to the season (certainly by Hamilton's standards), he still scored points on a consistent basis and almost always brought the car to the finish. He only suffered a single race retirement in Austria through no fault of his own when he suffered a fuel pressure problem. The only possible mistake you could say Hamilton made this season was in his home race in Silverstone, when he made a poor start from pole position and left himself vulnerable to being overtaken. He ended up being spun round by Kimi Raikkonen who was given a 10-second time penalty for his role in the incident. Even then, Hamilton still managed to finish in second place; impressive given that he was 18th at one point. This was one of 17 podium finishes this season, equalling the all-time record of podium finishes in a season for the third time (Hamilton achieved 17 podium finishes in 2015 and 2016 previously, whilst Sebastian Vettel did so in 2013 and Michael Schumacher in 2002). Of course, we must highlight how Hamilton was truly brilliant during the season. Some of his qualifying laps were simply on another level; in both Hungary and Belgium he claimed pole position in wet conditions, showing just how supreme he is in difficult and changing conditions. His qualifying lap in Australia was also very impressive, setting a lap-time which was 0.6 seconds faster than anybody else. However, the standout lap, arguably the lap of the season, came in Singapore on a track where Mercedes tended to struggle in the past; he claimed pole by setting a lap 0.3 seconds quicker than anybody else, and most notably 0.6 seconds quicker than his World Championship rival Sebastian Vettel, a stunning lap which amazed all F1 followers. He also had some brilliant races along the way, most notably in Monza, where he won in front of the Ferrari tifosi after getting past Vettel on the opening lap; he then put relentless pressure on Raikkonen till he made a brilliant overtake for the win. Other notable drives include Germany where he won after starting from 14th on the grid, and Russia, where, after poor strategy from Mercedes he lost track position to Vettel but pulled off a courageous overtake to regain the place. There were other race wins which were clinical and precise, such as those in Barcelona, France and Hungary. Hamilton is now just 18 wins short of Michael Schumacher's record of 20 and 2 short of the record for most World Championships, whilst already boasting the record for pole positions. The question now is: can Hamilton go on and equal or better these records? He has signed a new contract with Mercedes until 2020, which means that he will remain with the team for another two seasons. If Hamilton maintains his current driving level and Mercedes remain consistent, then doing so is definitely not impossible and few would bet against it. Hardly anyone can disagree that Hamilton was the best driver this season and fully deserved his World Championship victory. A season which started so promisingly for the German ended in disappointment. Vettel made far too many mistakes, which ultimately cost him the World Championship, especially given Hamilton’s consistent good form. He started the season in brilliant fashion, winning in Australia and Bahrain where he managed his tyres to perfection. In China, he was unfortunate to be involved in a collision with Max Verstappen (who was at fault for the incident) relegating him to eighth place. During the rest of the season Vettel made several costly, avoidable and stupid mistakes, while the Ferrari team let him down as well. In Baku, he locked up and ran wide when trying to overtake Bottas on the Safety Car restart, ending the race in 4th place; to add insult to injury, Hamilton went on to win the race. In Barcelona, Ferrari decided to make an additional pit-stop during a Virtual Safety Car period; this ultimately cost him track position as he slipped from second down to fourth. In France, at the start, he locked up and ended up steering into the side of Bottas - another driver error which cost him valuable points. In Austria, where Hamilton failed to finish, he placed third after a grid penalty. The worst error was on home turf at Hockenheim when, starting in pole position on a slippery track, he crashed out; to add to his misery, Hamilton went on to win the race. Driving mistakes by Vettel and strategy errors by Ferrari at Monza, Singapore and Japan cost him further championship points. In fairness, Vettel did have his good moments. His drives in Canada and Silverstone when out in the front were both excellent, and he excelled in Belgium after overtaking Hamilton in the first lap. In conclusion, Vettel made errors that he could not afford when up against a driver of Hamilton's calibre. This is the second consecutive season where he failed to win a World Championship when he had the tools at his disposal to do so. The question is: will Ferrari's patience with Vettel run out? They have replaced Kimi Raikkonen with Charles Leclerc, a young and hungry driver, putting greater pressure on Vettel - the question is: can he handle it or will it break his career? Despite this being his last season with the team, it was ironically his best season since rejoining Ferrari back in 2014. He achieved 12 podium finishes this season, as many as team-mate Vettel, and also got his first victory since Australia 2013 winning the United States Grand Prix; he also set the fastest ever speed in a Formula 1 car en route to taking pole position in Monza. However he suffered four retirements (Barcelona, Abu Dhabi, Belgium and Bahrain). The key area where Raikkonen struggled, however was in qualifying, losing that particular battle 17-4 with an average gap of 0.256s to Vettel. This led to his being sacrificed for his team-mate. One could argue that since being told in Monza that he was going to be dropped by the team for next season, Raikkonen’s performance improved. In the seven post-Monza races, Kimi scored only one point less than Vettel, in spite of not finishing in Abu Dhabi; excluding the latter race he finished ahead of Vettel four times and scored more points than his team-mate. Next year Raikkonen will be joining Sauber, for whom he made his F1 debut back in 2001. This could prove to be a good move for the Finn, as he joins a team making solid progress, and he will be free from the internal politics and pressures of being Ferrari’s wingman. There's no doubt that this will be an interesting move, one which could turn out to be a big success for an aging Kimi Raikkonen.